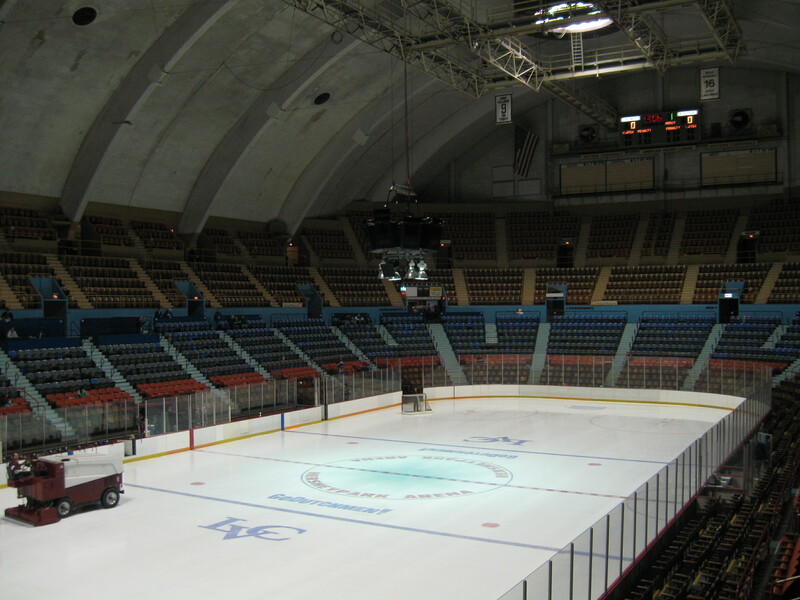 Original Post: Last year, I went to a Division III college hockey game at one of the last remaining truly old hockey arenas left in the country, HersheyPark Arena. It was an awesome building that was seemingly untouched from when it opened in 1936 and I found it amazing that a top minor league team (Hershey Bears) were able to play here all the way up to 2002. Well I was on the AHL’s home page the other day and the background image is a terrific photo of a game at the old arena, likely near when it first opened. You can see this great photo by going over to www.theahl.com and then right-clicking “View Background Image”. My favorite part is that center scoreboard where the game clock is an actual clock! I wonder how and who actually did the starting and stopping. I don’t think that AHL background photo is the Hersheypark Arena because the scoreboard has French notation. My guess is that it’s the Quebec Coliseum back when it was the home of the Aces of the AHL. Actually, this is the Hersheypark Arena. There is a separation between the 1st and upper levels. Also, if you look at the ice, it says Hersheypark Arena and LVC. The Lebanon Valley College hockey team now plays in the HPA. I have seen the Hershey Bears play multiple times when they would play the old Kentucky Thoroughblades. Never been to this arena though but would love to go. So much history has happened there, I love old venues with tons of character.